I guess I’ve been here before. My parents have the photos to prove it. In the summer of 1988, my parents drove my sister and me across the United States. A lot of that trip is a blur. Instead of a continuous memory of all the things we saw, I have a few snapshots in my head. One of them was a picnic near the main entrance of Zion National Park. 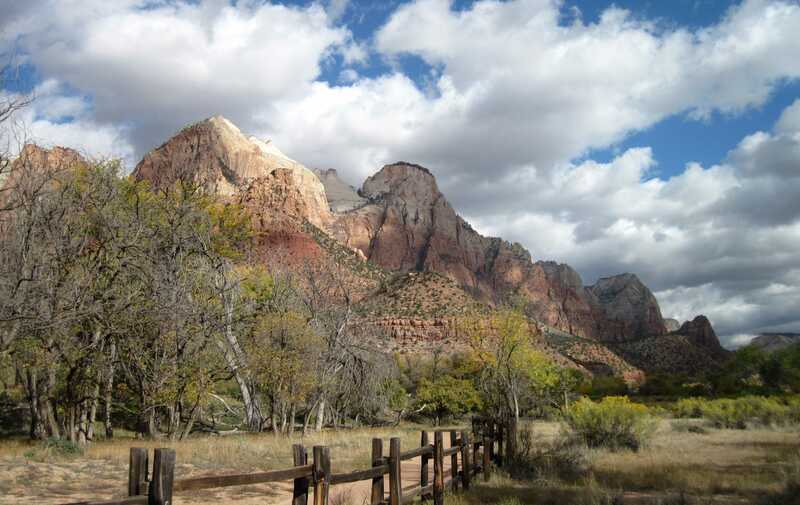 View from the river by the picnic area at the Zion Park entrance. The park has continued to erode over the past 25 years, though I don’t think I could point to specific places that have changed. The embankment where we ate lunch is now more developed, with paved paths, campsites an amphitheater, and a fence blocking the river. Yet I recognized it as the same spot I’d been to before. Exhaustion really caught up to me at Zion. The soles of my feet hurt with every step I took. My hips, knees and ankles were stiff and painful. I felt arthritic. I moved with a limp and some pretty obvious discomfort. But I kept moving, nonetheless. I wanted to see the hanging garden at Weeping Rock, and the vegetation and high cliff walls at the Narrows. I viewed it all, recording the sites and sounds and the feel of the air through my overtired stupor. At night, the overtiredness turned me into a small child who refused to go to bed. I kept Joe up to look at the stars with me. They were numerous and sparkly. Sitting on the picnic table next to our tent, I felt at peace with the world. I also felt how insignificant we are in the scope of the universe. View from the Visitors Center. Everything here was awe-inspiring and larger than life. I learned some geology at Zion. The upper layer of rock is harder than the rock at the canyon floor. When a river or stream passes, over–then eventually through–the hardened rock, it makes a narrow groove that erodes and expands downward (vertically) over time. This leads to narrow canyons. When the water hits the softer rock below, it expands horizontally, especially during flash floods. Eventually water erosion leaves the harder rock above it unsupported. Then the harder rock, these huge canyon walls, come crashing down. We left Zion a little earlier than initially planned. Partly it was the weather. Partly it was a feeling of being turned off by the over-the-top religious overtones of the park and the biblical nomenclature of the geological formations. It seemed both pompous and a bit too precious to name three plateaus “The Patriarchs: Abraham, Isaac and Jacob,” or a plateau that is mostly white with some red-orange down one side “The Altar of Sacrifice.” The names took away from the inherent beauty of the formations and made me feel less welcome in the park. 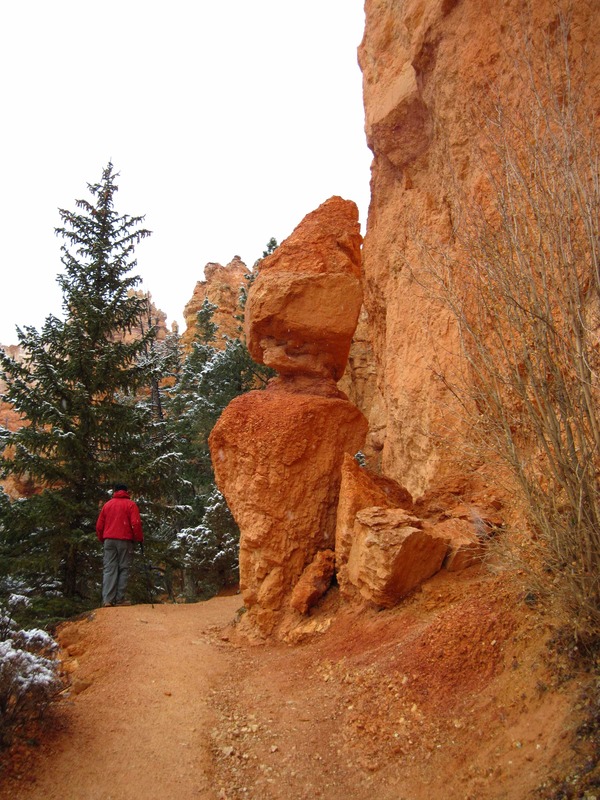 By the time we got near Bryce Canyon National Park, a 3-4 hour drive away, it was below freezing, and snow was falling. We decided to stay at Ruby’s Inn. 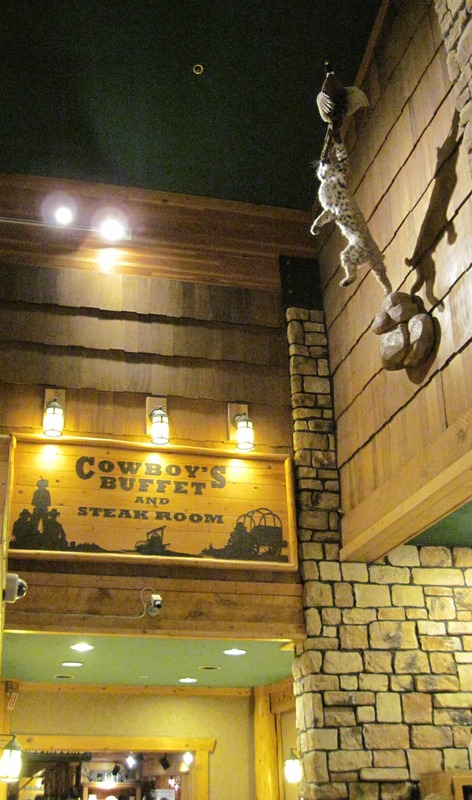 It was the perfect mix of warm, near food, and cowboy/western/hunter lodge atmosphere. It was nice to lie down on a bed. Camping was okay, but I slept better on a bed. We relaxed for the evening and at dinner at the Cowboy’s Buffet and Steak Room, attached to the motel. At Joe’s suggestion, I soaked in the tub with some epsom salt (purchased at the Ruby’s Inn General Store). The bath had a miraculous effect on my joints. All were better, except for my left heel and ankle, by morning. 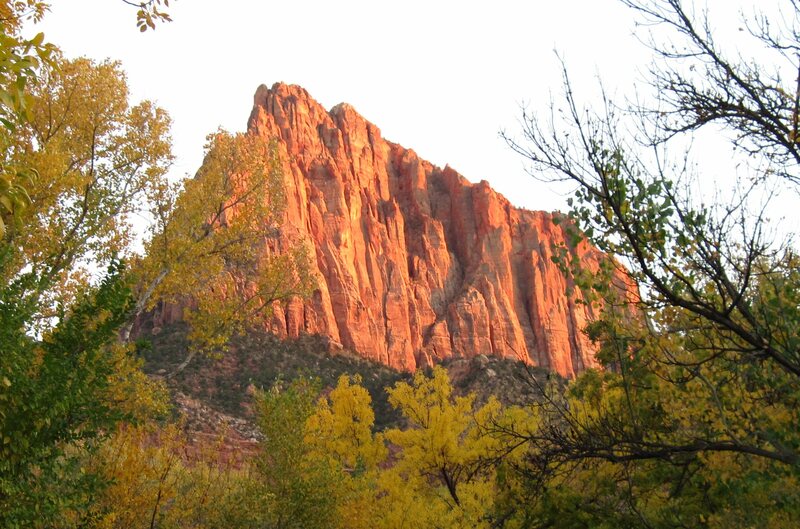 Walking on the Navajo Trail, the orange rocks were glowing. This afternoon, we relaxed. We went in the hot tub after a few laps in the pool. Then we took naps before a restful evening. My body has been somewhat cooperative. I continue to have eye floaters, but not the extreme number of the I had after eating wheat twice last Friday. My joints are achy, though the pain level has gone down a lot. My abdomen is alternating between huge and completely oversized. I’m doing my best not to let that bother me. My urgent bowels turned into two days of constipation…which ended this morning with urgent bowels again. All in all, I can live with the symptoms, though I feel very “Lyme-y.” A second soak tonight will hopefully help keep my joints in working order. I’m alternately excited and very tired. I want to see as much as I can, walk as far as I can, do as much as I can. I think I’ve dipped far into my personal energy reserves. With luck, I’ll recharge a bit tonight. Hopefully, I won’t crash before I return home. 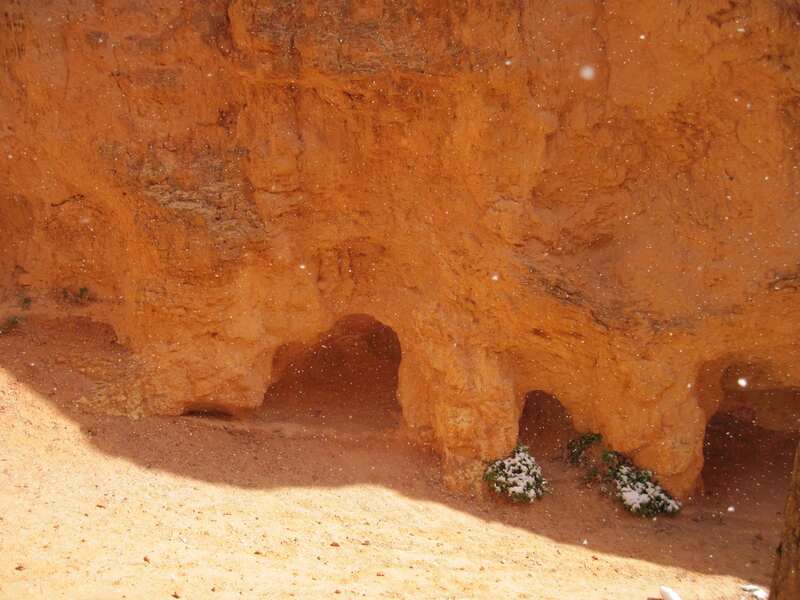 Snow falling in Bryce Canyon. Thank you for the encouragement. I have become a believer in the healing presence of the natural world, so I prioritize being there.